The Will County Clerk’s Office takes great pride in the diligent testing of our voting equipment. Internal tests are performed using Logic & Accuracy (L&A) testing. A Public Test is performed with Republican & Democratic chairmen and the State’s Attorney present. The same test deck of ballots run through the ballot counters are the same that will be used Election Day. The result from this test are then compared to the results from our internal tests. Both numbers must match in order to show that the machines are consistently reporting properly. While voting is conducted by mail, Early Voting or at the Polling Place, a voter must sign a ballot application before receiving their ballot. The application and ballots cast must match at each location. 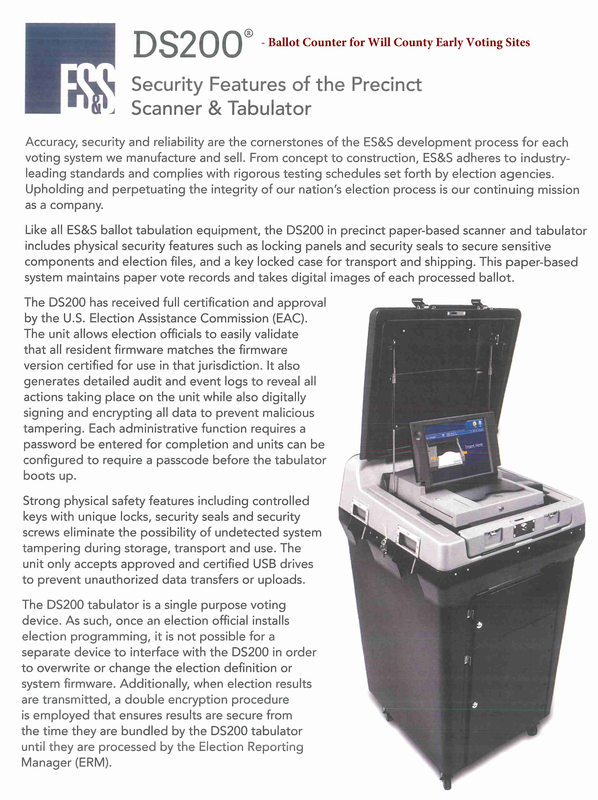 The ballot counter will display how many ballots have been cast on it. 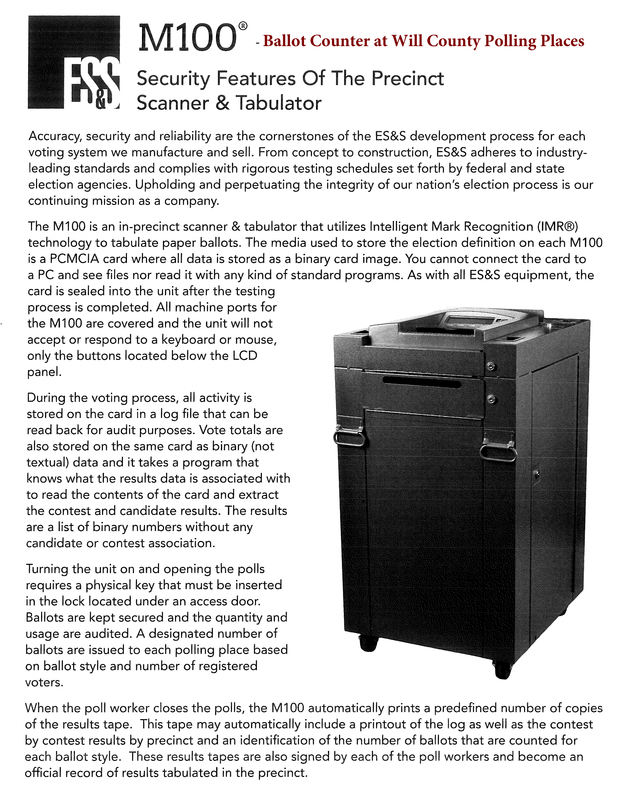 There is only one system in Will County, the AutoMARK Voter Assist Terminal darken the oval for the voter, then they insert their ballot into the ballot counter where it is tabulated. Some counties have two separate systems that they must balance out on Election Night. A Post-Election Re-Tab is conducted. The IL State Board of Elections provides us with a list of precincts and early voting sites we must re-tabulate. The same ballots that were originally cast are fed through the same equipment used either Election Day or at an Early Voting site. Republican & Democratic chairmen and the State’s Attorney are also present for this task. 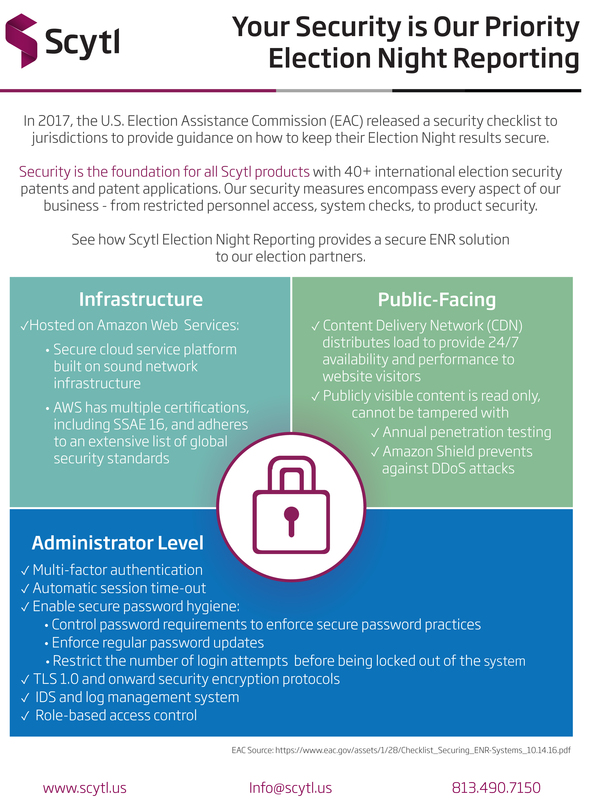 The results from this test are then compared to the results from the Voting Results Tapes printed on Election Night or at Central Count. Both numbers must match in order to show that the machines are consistently reporting properly. This is the whole reason why a paper trail ballot is still necessary in Illinois. If there is ever a close race and a candidate files a discovery recount, we can even hand count the ballots if necessary to prove the results are accurate. This rarely occurs since the candidates and voters trust the integrity of our elections in Will County.